Based in Oregon, Georgie's Ceramic and Clay Co. has long been known as a supplier of clays and glazes for the Pacific Northwest and beyond. 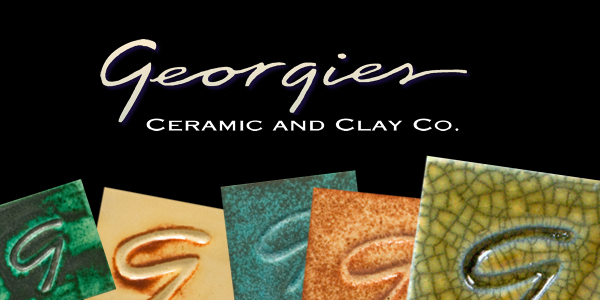 The Ceramic Shop is pleased to announce that we are now distributing Georgie's Cone 6 Sculptural and Textural Glazes, as well as Georgie's Interactive Pigments, which is an exciting line of washes also formulated for cone 6. These glazes have been extensively tested in the Georgie's Portland-based lab, and the brand does certainly have its loyal followers. High-quality blends and a fan base -- we had to start carrying these glazes! Cone 6 Sculptural/Textural Glazes: These glazes have remarkable versatility, and even better, they're fun! The glazes are reactive and interactive with each other and with your clay body. Even changing the application thickness can produce a wide range of special effects. With so many different combinations to try, you'll be experimenting for years to come. All of the Cone 6 Sculptural Glazes are nontoxic; however, not all are food-safe because some have dry or breaking surfaces after firing. We recommend bisque firing to cone 04, glaze firing to cone 6 at medium speed, and venting your kiln for all kiln firings. Cone 6 Gloss Crackle Glazes: An extension of Georgie's Cone 6 Sculptural/Textural Glazes, these glazes have been specifically designed to promote an attractive crazing or crackling effect! It should be noted that these glazes look their best and deliver intended results when they are used on porcelain or tight, white stoneware clay bodies. Crackle glazes are NOT food-safe because of the nature of their fired surface. In order to highlight the crackle effect of these glazes, simply glaze and fire your piece, and then coat it with India ink and wipe off. The India ink will seep into the cracks, highlighting the unique patterns that formed in your kiln. Please note, however, that India ink should ONLY be used when the clay beneath the glazes is indeed vitreous (fused and waterproof as a result of firing). If the clay is not vitreous, the India ink will soak into the clay body and spread, with potentially less-than-desirable results. If the ink soaks in, there is no cure other than refiring the piece to burn out the ink. • Use them under your glazes for solid color coverage or design work. • Use them with wipe-back techniques for antiques finished to enhance texture, either alone or under a glaze. • Use them over raw glazes (dry but unfired) for majolica techniques at cone 6. • Use them with wax resist and multiple glazes for inlays and other design techniques. If you have any questions about any Georgies glaze or wash that we carry, we’re happy to help! Give us a call!